We live here with our 14 years old daughter. The older three have moved out and have their own families now and live nearby. 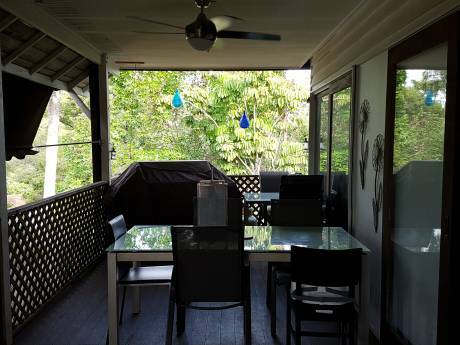 Our house is a Large split level family home only 10kms from Brisbane city centre. It is a modern brick home on three levels. Living up stairs, bedrooms next level, rumpus room and study downstairs leading out to the pool. Shops and bus close by. 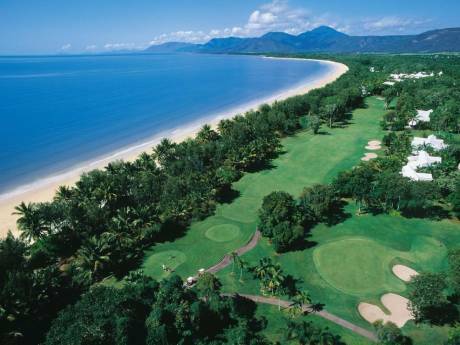 Surfers Paradise, Gold and Sunshine coast only 1 to 2 hours drive. 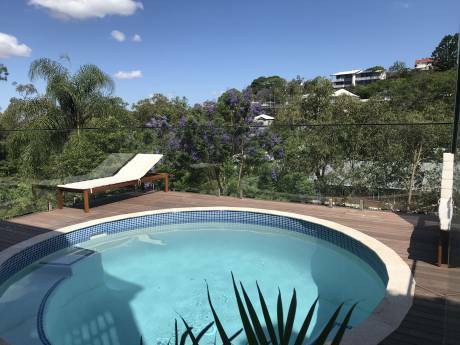 Chapel Hill is a quiet up market family area close to a large Westfield Indooroopilly shopping centre. At the end of our street is Brisbane Forest Park and you can walk to the Mt Cootha lookout kiosk and the TV stations which overlook the city. Lots of gum trees in our neighbourhood. We have friendly neighbours and own a cat who the neighbours feed while we are away. She is old so may not be here by Christmas..17 years old. December/January is our summer so the pool is a good way to cool off. We have air-con in the kitchen/lounge area. Car exchange could be organised as well. Chapel Hill is a quiet western suburb of Brisbane. Very peaceful amongst the gum trees. Only 10km from the city...15min drive or bus every half hour from the end of the street. Bus No. 425. A large shoppingtown is only 5 minutes away...Westfield Indooroopilly. We are in our mid 50's. The three older children are now married with their own families and live in Brisbane. Our 14 year old daughter is at High School but is on school holidays from 28 November 08 until end of January 09. We plan to travel with her for two months taking in Europe and the UK. We have relations in Wales. Our plan at present is to fly to London and maybe do a three week bus tour of Europe, spend Christmas in Wales with relatives, a week around New Years Eve in London then hire a motorhome for a week and travel around Scotland. If we have time maybe see Ireland. Our trip is in the early stages of planning at the moment. Previously we have only travelled to NZ and Fiji.